The government on Tuesday ordered a ban on the shipment of rice harvested in two more districts in Fukushima Prefecture, after tests detected dangerously high levels of radioactive cesium. Chief Cabinet Secreatary Osamu Fujimura said the central government has instructed Fukushima Gov. Yuhei Sato to impose the ban on about 1,900 kg harvested in the Oguni district and 1,500 kg in the Tsukidate district, both in the city of Date. On Monday, the Fukushima Prefectural Government announced that a combined 3,400 kg of unmilled rice harvested by two farms in the Oguni district and by one farm in the Tsukidate district contained between 580 and 1,050 becquerels per kilogram of radioactive cesium. The government’s limit is 500 becquerels. In October, Gov. Sato officially announced that test results for rice at 1,174 spots in the prefecture, including Date, confirmed that Fukushima’s rice was not contaminated by radioactive materials and was safe to consume. The initial inspections showed that 82 percent of the rice tested showed no traces of contamination, and the remaining samples contained radioactive cesium below the government-set limit. Asahi Shinbun has a convenient map that plots locations where the rice has been found with radioactive cesium far exceeding the provisional safety limit of 500 becquerels/kg. The white circle is Onami District in Fukushima City where up to 1270 Bq/kg of radioactive cesium has been found in the rice. The two red circles are the locations in Date City where the rice exceeding the limit has been found this time. So far. And unlike in Onami District in Fukushima City, they are only testing one bag out of every 50. Some comfort. After radioactive cesium exceeding the provisional safety limit was detected in rice harvested in Onami District of Fukushima City (former Oguni-mura), Fukushima Prefecture announced on November 28 that rice from 3 farms in the adjasent areas of Onami District, former Oguni-mura and former Tsukidate-machi, both of which became part of Date City, was found with radioactive cesium exceeding the limit. Part of the rice has been sold in the market. 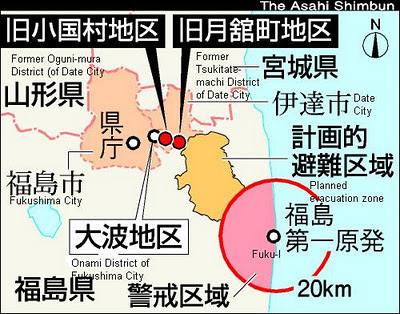 The prefectural government has requested that the shipment of rice from these two districts to be voluntarily halted. The national government is going to order the halt of the rice shipment from the districts. According to the Fukushima prefectural government, 9 kilograms of “mochi” rice harvested in former Oguni-mura part of Date City had been already sold to consumers at a local farm stand. This is the first case of the rice exceeding the limit having been found to have been sold to the general public. According to the prefecture, in former Oguni-mura of Date City, 2 samples from 2 farms out of 119 samples from 101 farms tested 580 becquerels/kg and 780 becquerels/kg respectively. In former Tsukidate-machi of Date City, 1 samples from 1 farm out of 8 samples from 6 farms tested 1050 becquerels/kg. Just to remind you: If a government ask you to voluntarily do something, the government does not compensate you for your inconvenience. If the government orders you to do something, then the government is obligated to compensate. The Fukushima prefectural government hasn’t posted the press release on their website yet, but Yomiuri Shinbun (11/29/2011) reports that 4 additional farms in Onami District of Fukushima City had the rice whose radioactive cesium exceeded the provisional safety limit, bringing the total to 10 farms. The prefecture and the media are trying their best to isolate these cases as “special”, saying that these farms are located in the mountains or near the mountains. Well, I would think that condition applies to the significant number of rice farms in Japan.